A repertoire of songs for mixed choir adapted from the indigenous music of the Embera-Chami people (Cristianía – Antioquia, Colombia) which form the basis for five pieces of music arranged by the composer Felipe Tovar. The themes of the songs selected for this repertoire reference various forms of musical expression that are part of the indigenous community’s cultural heritage and include, amongst others: spiritual songs, festive songs and love songs. Êbêrâ Ûêrâ Dau Pâîma (Black-eyed Embera woman). The song refers to the female custom of leaving the community in search of her future spouse, dividing its focus between admiration for the woman who prevails and the distrust awakened among the outsiders. Chi saupa pono? (Do you know this flower?) – The song of the jungle spirits. This piece is based on a sung legend which tells of the dojura or ‘spirits of the river’, in which a mother continually questions her ‘little daughter’ (káucheke) about a flower that grows on the river bank. Tila, Tila (Tila – a female Embera name), a love song. A man invites a woman to move down stream with him after taking her as his wife. 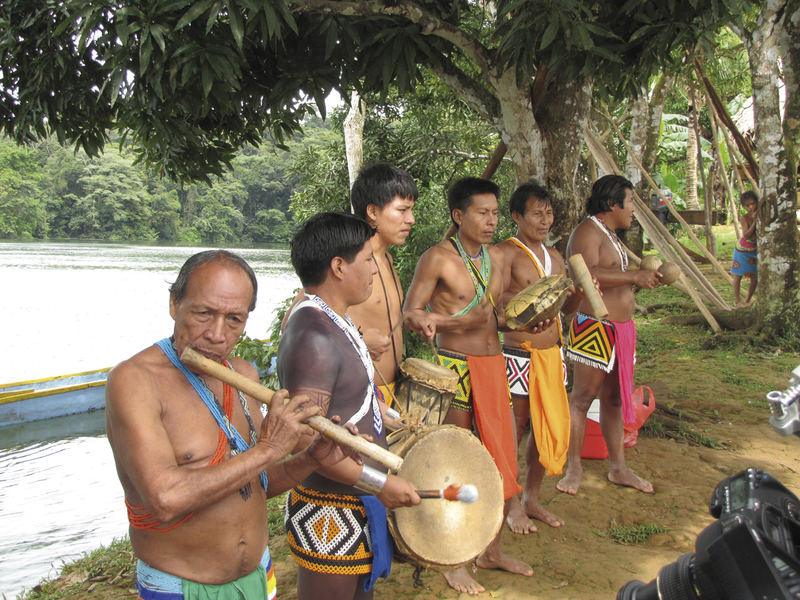 The song describes the traditional way in which the Embera disperse their dwellings along the banks of the rivers, in this way forming new family units. Ituade Choroma (The Festival of the Great Drink), a song of drunkenness. A song linked to the harvest season for corn. Copâre Balbinito, a song of drunkenness. 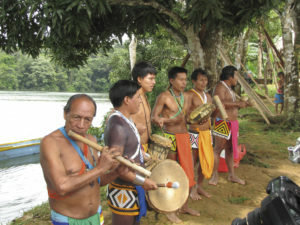 A festive song in which Embera women provocatively and insistently beg their husbands to feed them chicha – a fermented corn-based alcoholic beverage. FORM: The formal structure of the piece clearly remains in constant harmony with its lyrical content throughout; similarly, the composer seeks to reproduce the most important musical material or melody lines taken from the original songs. Second movement: divided into six parts of similar length which correspond to the structure and poetical expression of the lyrics. Third movement: as with the first movement, it adheres to a ternary form in which each part is of a similar length, whilst the end features a coda. Fourth movement: the formal structure features two extensive sections: the first, subdivided into subsections; and the second which presents contrasting changes in tempo and texture. Fifth movement: maintains its unity through continual reiteration of the same melodic phrase. TEMPO AND METER: Changes in tempo and the subdivision of the beat remain for the most part closely related to the formal structure; similarly, changes in meter and the use of syncope coincide with the agogic accents in the lyrics. MELODY: The traditional songs are clearly represented and feature repeatedly, standing as both the point of focus and the point of initiation for the movements. In terms of the original language of the melodies, the songs which feature in movements 1 and 4 provide the context within which the tone is set, whereas songs which feature in movements 2, 3 and 5 provide the mode; nevertheless, the harmonic structures which are formed between principal and subsidiary melodies, or the construction of resonant blocks of sound, generate tones associated with other languages, such as politonalism, pandiatonicism, modalism and extended tonalism. First movement: the first section is based on triadic, diatonic and broken block chords in the scale of D mayor; these chords are embellished through the use of chromatic or diatonic accents that generally speaking do not distort chord tones based on conventional triad chords; chords resulting from the use of the Phrygian mode can also be heard. Second movement: composed based on two tonics: one in C minor and the other in G major. The harmonic structure of this movement can be perceived to be tonal-functional with non-modulating chromaticisms generated by mixed tones in which the tone’s chord unanticipatedly changes its quality from major to minor and vice versa. Third movement: made up of triads taken from the Doric and Mixolydian modes. The central section (cc. 17-31) has no clearly defined harmonic centre, as the harmonic and melodic material is constructed based on a symmetrical scale or mode of limited transposition. It should be pointed out that this section lends a different harmonic colour to the piece, since the chords are often created using seconds, fourths, and on rare occasions, thirds. Fourth movement: in the key of G major; there is recurrent use of triads with tonal function, as well as the presence of dominant chords which have undergone chromatic alteration. Moreover, there is the potential within the movement for solutions other than those provided by the use of dominant chords. The use of altered dominant chords allows the true tone of the augmented chords to be heard. Fifth movement: here the composer returns to the central axis of the piece, in this way giving it an overall sense of unity. The introduction is based on augmented chords and a section that commences in C.8 and concludes in C.22 and is elaborated based on principles of 16th century counterpoint. Towards its end, the movement reintroduces the harmonic material of the first movement. First movement: Changes in texture are introduced within the formal structure. For example, the first section is choral, whereas the second is noticeably counterpoint. Second movement: this homophonic texture is predominantly homorhythmic and largely features block chords. Third movement: a choral movement, featuring a melodic configuration shaped by whole tones, accents and chordal notes. Fourth movement: dominated by block chords as well as a homorhythm. Fifth movement: in contrast to preceding movements, this movement presents counterpoint textures throughout; whereas its close features block chords in support of the homorhythm. NOTATION: Conventional, including some passages which are successful in producing sound effects, bringing contrast to the piece. An exception in this respect is the passage in C.12 in the second movement: at this point the male voices sing in aleatoric rhythms which produce a resonant effect that provides backing for the remaining voices. PITCH: The fifth movement includes a passage in which there is a noticeable change in colour; the soprano soloist is required to alter her technical approach in order to sing a passage with an open throat, in this way mirroring the singing style of the original song. Nevertheless, the remaining voices continue in the renaissance polyphonic style, thus creating an overtone. Each movement recreates a distinct ambience which evokes a natural event. The piece makes use of onomatopoeia and body sounds in order to imitate the sounds of nature, such as the calling of birds, frogs and insects. The sound of the wind, the rain and claps of thunder, amongst others, are also imitated. Night in the forest. Evokes the tranquil landscape of a humid forest at night. The effect of the voices is to imitate the sound of the raindrops, the whistle of the wind in the trees and the calls of nocturnal birds, the frogs and the insects. Storm. The movement begins with a number of wails which imply a sense of unease. The sounds of anxious birds, as well as other sounds, echo in the night; suddenly, a loud clap of thunder breaks the night’s silence, unleashing a storm. The movement draws to a close as calm returns and the rain begins to subside. Rising sun. A tone cluster, made up of eight sounds, marks the rising of the sun on the horizon: the beginning of a new day. The sound of a swarm of bees calmly flying by as the storm reaches its end is imitated by female voices. First movement: made up of six separate sections, marked by changes in colour and structure as dictated by the verses of the poetry. Second movement: divided into six sections as marked by sudden changes in texture, dynamics and rhythmic pattern. Third movement: made up of five sections divided clearly by changes in the texture and harmonic density. TEMPO AND METER: As with the first movement, there is a noticeable connection between the meter and the accentuations of the text. In the second movement, the changes in time, as well as its rhythmic articulation, emphasize the energetic style of the poem. MELODY: The melodic motion is in keeping with the chords or blocks of sound, as opposed to the individual motion of the voices. Nevertheless, the lines remain static and within a limited range as a result of the piece’s focus on diatonic clusters. HARMONIC PROCESSES: Modes, pentatonics and pandiantonics are the dominant harmonic resources used in the piece. The vertical structures comply with diatonic, and on occasion, chromatic clusters but predominately express themselves through the use of modes. They are also formed based on major and minor seventh and ninth chords. The form of the piece exhibits changes in texture, dynamics and rhythm. First movement: Harmonic complementarity is a constant feature of the movement, which in producing fifth chords, gives it a diatonic Lydian mode in D minor. The mode is largely a result of the presence of some non-diatonic notes. Second movement: centred on the note C, upon which harmonies are formed, most often in minor tones. Third movement: centred on F, and as with the other movements, featuring modal shifts in the same or neighbouring tones. TEXTURES: The texture of the piece is predominantly homorhythmic, where the homorhythm can be identified in two ways: firstly, as the product of the combination of sounds that make up diatonic clusters, thus resulting in ethereal, volatile and minimalist colours. Secondly, it results from the motion of diatonic block chords that move homorhythmically. PITCH RESOURCES: The harmonic density achieved in the piece results from the composition of the first movement in eight voices, as well as the continual use of divisi in the remaining two movements. Such harmonic density results in diatonic clusters or triadic structures which cover ranges of more than two octaves. The piece also features effects produced by vocal sounds, whistles and clapping, amongst others; although such effects do not require advanced vocal techniques (given the conventional way in which they are produced), they create resonant ambiences that give the piece exotic tones and, above all, serve as literal representations of the images evoked by the titles of each movement. The way in which the piece builds musical textures, as well as its resonant effects, are both suggestions that it has been strongly influenced by North American composers Eric Whitacre, Paul Helley and Morten Lauridsen.